Family Volley: While Nursing Babies - Clarisonic Giveaway! While Nursing Babies - Clarisonic Giveaway! Nursing 4 kids over the last 10 and a half years, I have spent quite a bit of time by myself. Well, not really by myself. But a lot of time just me and a hungry baby. Although I always try to make eye contact and focus on them while they are eating, in the middle of the night, with only a few hours of sleep, I have often sought out distractions to keep me awake. It seems with every baby, I have found something a little different. With our son, I would turn on the Food Network. That was back in the day when the network was just getting big. I learned sooo much during those midnight and 2 am feedings. I developed a passion for cooking and food. Back when the Two Hot Tamales came on right after Emeril. Before "Bam" was all the rage. With our daughter it was QVC and HSN. I never bought one single thing, but I was up in the middle of the night A LOT with her, and I appreciated that the networks never slept and always had a friendly face talking back to me. If only those hosts knew how much support they were during months 3-6 when our daughter had a hidden inner ear infection and I was sure I was going to be the first to die from lack of sleep. I really should have written them thank-you's. With our third child I had an iPhone. Surfing the web, and checking out Facebook kept me awake when my tired eyes just wanted to quit. Our last baby was born right when Pinterest hit phones. Pretty sure my addiction started during those middle of the night feedings. Although I am not nursing any babies right now, our babies are growing up and I seem to be spending less time in the rocking chair and more time in the car waiting for them at school and activities. Lately I have been passing the waiting time by playing a little Solitaire Deluxe by Mobile Deluxe. Years ago my grandma taught me to play solitaire. I have always loved it, and now, when I have some waiting time, I play. It keeps me thinking, passes the time, and brings back great memories of my grandma too. This year The SITS Girls are joining with Mobile Deluxe to help you find more Solitaire-y moments in your life. They are kicking off the year by giving away TWO Clarisonic Prize Packages valued at $225 Each. In creating more “me” time in 2013, why not start out by adding a super fun game to your smart phone? That’s right, we’re talking about Solitaire Deluxe, a pick up and play game that everyone knows. a Rafflecopter giveaway What do you do in your Solitaire-y time? Solitaire Deluxe is an absolutely FREE download that you can “pick up and play” anywhere… even without an Internet connection. Other fab features about the download? (1) It is 4.5-star rated app in iTunes and Google Play, (2) includes simple tutorials for all 16 games, and (3) makes it super easy to find friends using Facebook connect. 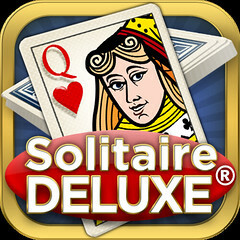 Download your FREE Solitaire Deluxe game now! This is a sponsored post written by me on behalf of Mobile Deluxe. Saw this pop up in my Twitter feed after I just finished pumping and uploading pictures to Shutterfly. LOL. I spend my nursing \ extra time on pinterest these days. I never really did anything to occupy me while nursing. I generally just enjoyed the quiet moment. Maybe I'm weird because I've had a lot of friends like you. We'll see if this next time around proves different. Yep! I downloaded the app on my Droid.